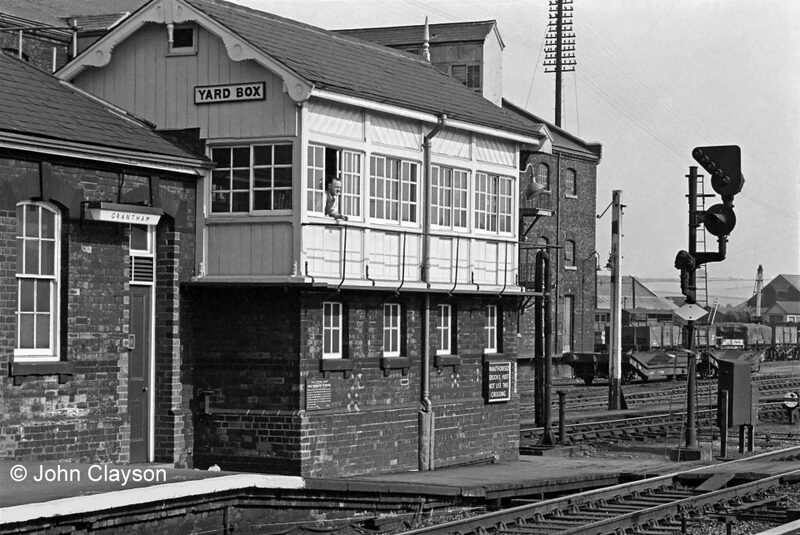 Grantham Yard was one of three new signal boxes opened at Grantham during 1874 and 1875. Government legislation and regulation relating to railway safety, in particular the requirement for interlocking between points and signals, meant that many more signal boxes were being built at main line stations such as Grantham, where increasing speeds and more complex track layouts increased the risk of collision. two short sidings, engine spurs, for locomotives being prepared to take over southbound trains. The principal lines of communication at a signal box are with the neighbouring boxes in each direction along the railway. The next box to the south of the Yard Box was Grantham South situated about 500 yards away, which opened on the same day as the Yard Box. At first, in 1874, the next signal box to the north was Grantham Junction box which was at the convergence of the line from Nottingham, about ¾ mile north of the station. On 26th October 1875, however, the first Grantham North signal box opened, and it took over from Grantham Junction as the box next to the north of Grantham Yard. I would take the opportunity of observing that as this is a very important cabin, at which the work is incessant, it is desirable that the Signalmen should be kept on duty for 8 hours only, instead of 12 hours, at each turn of duty. 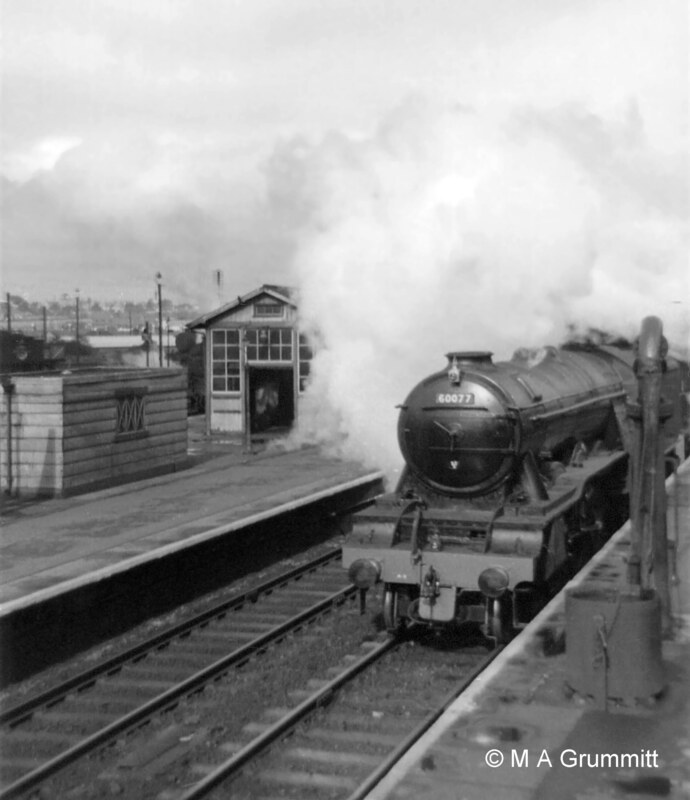 In those days the duration of a Signalman's shift at most signal boxes on the GNR was 12 hours. Main line railway signalling in the busiest boxes had become an intensive activity, highly demanding of the Signalmen both mentally and physically. The work required the full concentration of the men over the entire length of their shift. The Board of Trade, responsible for railway safety on behalf of the public, was lending its weight to a campaign, begun in the 1860s, to make 8-hour, 3-shift working normal practice in busy main line signal boxes. A new Up Goods line had been opened from Grantham South box to Great Ponton in 1874, and onward to High Dyke in 1882. This relieved the Up Main line of slow mineral and goods trains for the five-mile climb to Stoke Tunnel. In 1886 this Up Goods line was extended back from Grantham South to Grantham Yard. 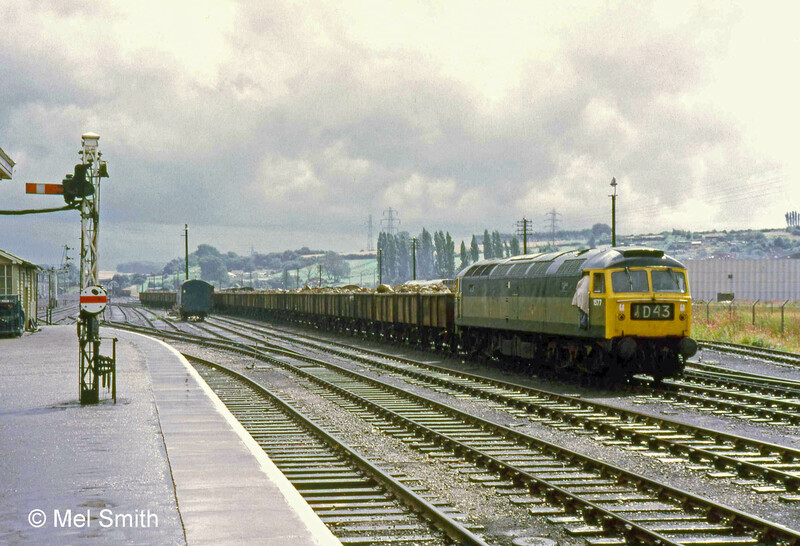 From then until the Yard Box closed in June 1971 one of the main duties of its signalmen was to divert most southbound mineral trains, and many goods trains, from the Up Main line to the Up Goods line to allow them to be overtaken by faster traffic. In this view of 17th June 1902 looking south Grantham Yard signal box is just off shot to the left. On the left are the two locomotive spurs, with shallow pits to assist inspection and oiling round, where locomotive No. 877 is waiting to take over a southbound passenger train. To the left of the approaching northbound express is a series of crossings which link, in receding order, the Down and Up Main lines to the Up Goods line and the goods yard sidings. The northbound express is approaching on the Down Main line under clear signals, the upper arm controlled by the Yard Box, the lower by the North Box. In the shadow of the coaches on the right is a spindle-mounted disc signal to control shunting movements from the Down Main platform across the connection to the right. It has '32' picked out in white paint - the number of the lever in the Yard Box which operated it. The dock in which the coaches are standing was one of two short sidings, long-standing features of the layout where coaches or vans could be kept in readiness for adding to northbound trains. Photograph by Rev. T.B. Parley from the John Tatchell Collection of the Historical Model Railway Society (HMRS). 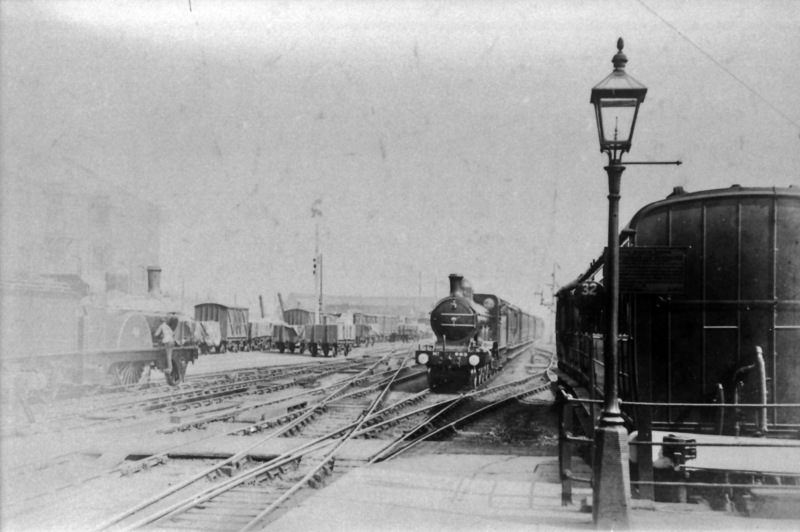 In 1903 a new Down Slow line was opened between Grantham South and the Western platform, its approach to the station being under the control of the Yard Box. This required more capacity at Grantham Yard and the lever frame was extended (or possibly replaced) to provide 50 levers. Here is a first-hand description of how locomotives were changed on the southbound 13-coach Flying Scotsman at the Yard Box. We pulled into Grantham just about 'right time' and Father and I immediately alighted to watch the change of engines which took three minutes. The fresh engine was waiting in the siding and the train engine ran forward to allow the fresh engine to back onto the train, after which the other engine backed into the siding to await the opportunity to cross over the running lines and go on shed. one of the two short spurs into the dock at the south end of the Down platform was removed. 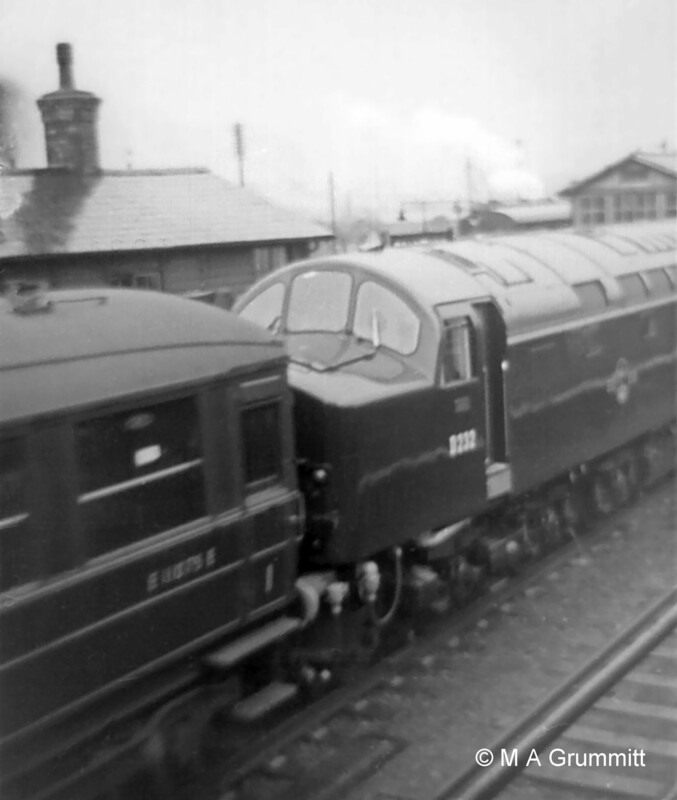 In the 1950s the use of diesel multiple units (known by Grantham railway staff as railcars) on local trains, along with reductions in local services, reduced the use made of the carriage sidings. Also from the late 1950s, with the introduction of diesel electric locomotives on main line services, the intensive routine of locomotive changes rapidly tailed off. It had been a tradition at Grantham since the 1860s. 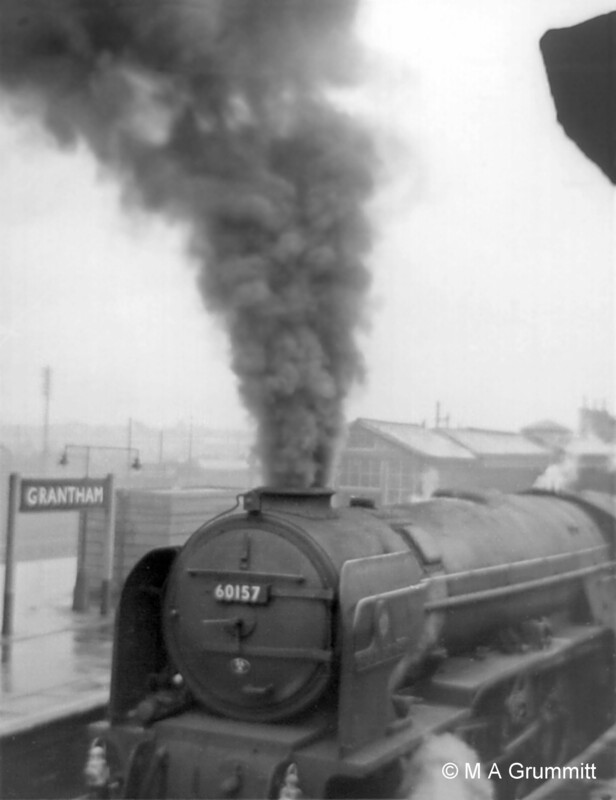 The rundown of passenger and freight rail services across Britain from the mid-1960s led to rationalisation of track and signalling around Grantham. Higher speeds on the main lines demanded the elimination of as many points and crossings as possible to reduce maintenance. At the same time, power signalling technology enabled the remote control of points and signals over a wide area from electronic switch control panels. The writing was on the wall for traditional mechanical signal boxes, especially those on intensively operated high speed main lines. On 27th June 1971 Grantham Yard box closed. Control of the junction points for the Up Slow line passed to Grantham South and the carriage siding connection to the Western platform was taken out of use. Although Grantham Yard signal box was no longer an operational entity, its building was taken over to be adapted for the installation of an electronic switch control panel that, in February 1972, would take over the signalling of the entire Grantham area. It became 'Grantham' signal box, whose story will be told on a separate page. The following series of photographs illustrates some of the developments at Grantham Yard signal box described above. The lofty Grantham Yard Box Up starting signal overshadows handsome A1 locomotive No.2552 Sansovino, whose crew are making ready to depart for the south. The signal shows 'clear' for the Main line into and through the section controlled by Grantham South box - the lowest arm, with the vee end, is the South Box distant signal. The two high-level arms are 'co-acting' with the corresponding main arms beneath them. Signals had to be visible from a distance to give drivers time to respond, and the high-level arms and their lamps could be seen over the staion footbridge from the footplate of an approaching train . They are also larger in size, to aid sighting from a distance. The signals on the left relate to the Up Goods line, which diverges to the left just beyond the platform. They were positioned at a lower level because it was the less important route. There are several sturdy stays to support the overhanging weight of the bracket and its equipment. This scene dates from the late 1920s or the 1930s. In the late 1930s or the 1940s the GNR 'somersault' signal arms were replaced by modern upper quadrant arms. Photograph by courtesy of Graham Cloxton. The tall semaphore signal seen in the previous photograph was replaced by the colour light signal on the right. On evidence currently available this change took place between May 1953 and July 1955. Can anyone tell us exactly when? Photograph taken on 5th September 1963 by Cedric A. Clayson. To preserve the advance sighting provided by the high level semaphore arms and lamps, a banner repeating signal was placed near the north end of the Up platform. The Yard Box Up Main/Up Goods starting signal banner repeater is to the left of the locomotive. Its purpose was to give warning to drivers of the aspect of the colour light signal at the end of the platform before it came into view; because of the curve of the line it was obscured at this point by the platform buildings. In this photograph the banner repeater is indicating that the signal itself shows 'red'. Here is a link to a photograph where the banner repeater is showing that the starting signal at Grantham Yard box is 'clear' (yellow or green) for the Main line. These photographs were taken by Mick Grummitt, who worked as a Rest Day Relief Telegraph Lad in boxes at Grantham and Peterborough between 1959 and 1962. Although there was not normally a 'Tele Lad' at the Yard Box, Mick was occasionally asked to work there to help out. The view from the Yard Box as A3 No. 60077 The White Knight approaches on the Up Main line with a class H freight from Doncaster to New England (Peterborough), running in after overhaul at Doncaster Plant. A1 No. 60151 Midlothian waits at platform 2 with a southbound passenger train. A3 No. 60058 Blair Athol passes the Yard Box windows on departure with a southbound train. 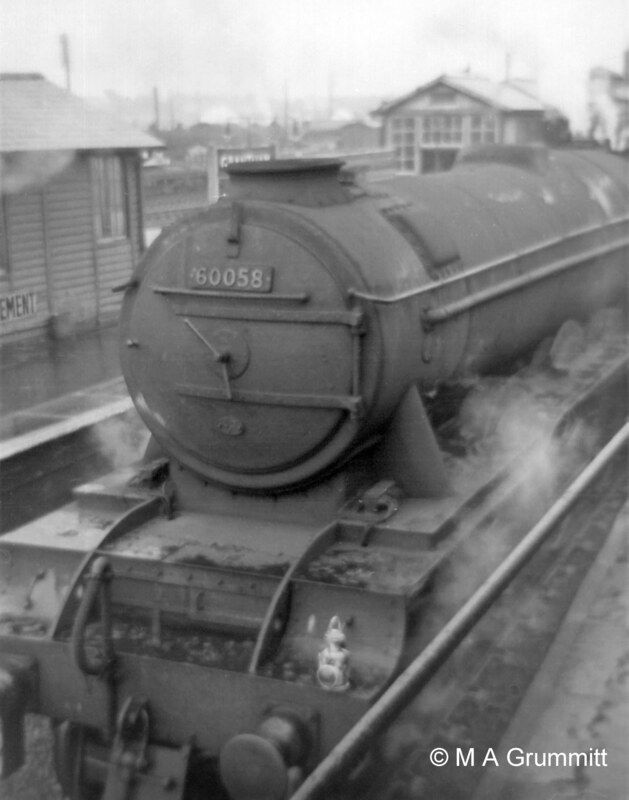 In some weather conditions signalling staff, in their elevated position at the end of a station platform, could be wreathed in locomotive smoke. The fireman of A1 No. 60157 Great Eastern has prepared for the 5-mile ascent to Stoke Tunnel from a standing start at Grantham by adding fresh coal to the fire. Had the wind been from the north west, the Yard Box may have been enveloped in smoke for several minutes . Much cleaner! 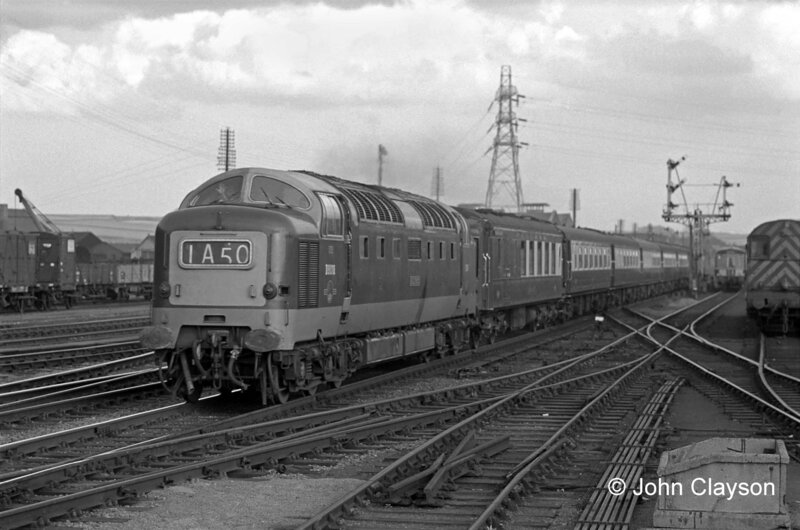 The new order, in the shape of gleaming English Electric Type 4 (later Class 40) No. D232, passes northbound brand new on a trial run. 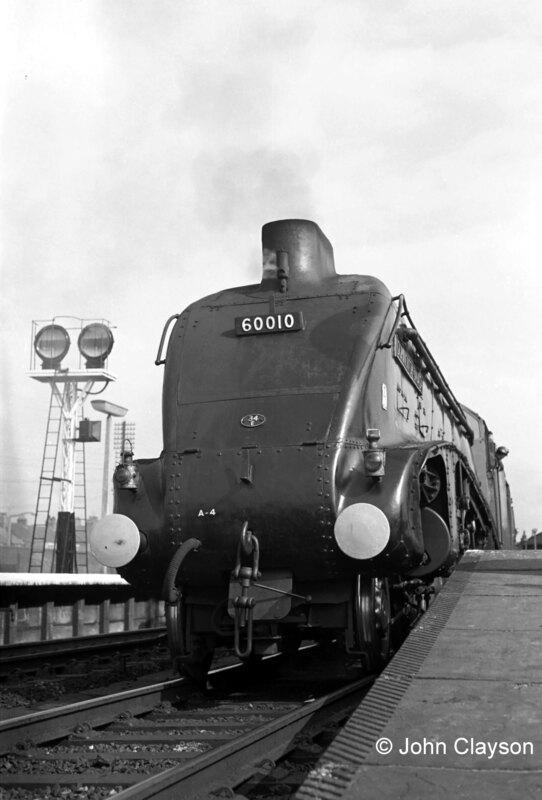 These locomotives were not popular on the East Coast Main Line because of poor relibility. 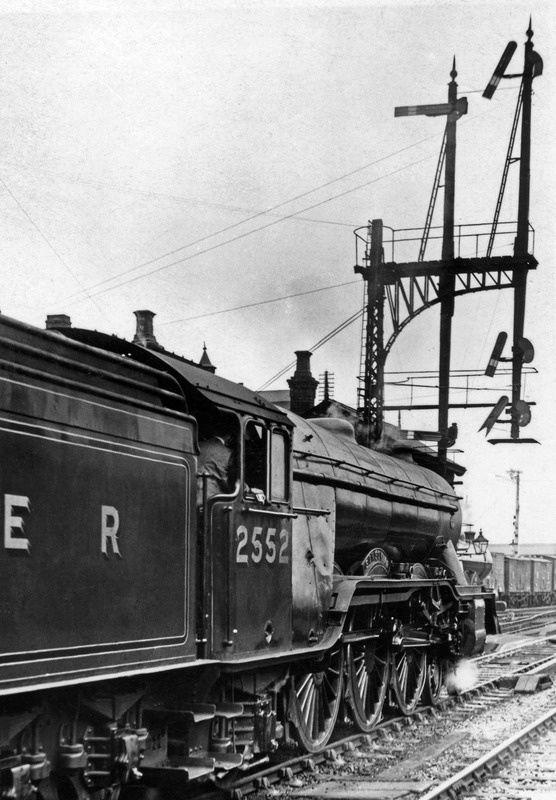 D232 spent nearly all its working life on the West Coast Main Line, carrying the name Empress of Canada after the Canadian Pacific liner which sailed regularly out of Liverpool. On April 30th 1964 the track and signalling on the Down, or northbound, side approaching the Yard Box remained as it had been for 20 years. The locomotive is approaching a trailing connection from the Down Slow line (on which a railcar waits at the signal). The second and third coaches are passing over a crossing which leads from the Western platform to the Up Main and Up Goods lines. The diesel shunter is in No.1 Carriage Siding. The line in the immediate forground is a short spur which ends in a dock at the south end of the Down platform. It is equipped with a trap point to derail a vehicle which might accidentally move towards the running lines. Train 1A50 was the 17:00 from King’s Cross to Newcastle, The Tees-Tyne Pullman - a luxury service between London and Tyneside for businessmen. It is hauled by ‘Deltic’ locomotive No.D9018 Ballymoss. This view of 6th February 1966 shows that, in the area controlled by the Yard Box, all points and crossings have been removed from the Down Main line on which the train is approaching. The Down Slow line, to the train's right, is accessed at Grantham South. No.1 and No.2 carriage sidings still appear to be fully occupied. Train 1A42 was the 3pm departure from King's Cross for Newcastle, hauled on this occasion by Brush Type 4 locomotive No.D1982. 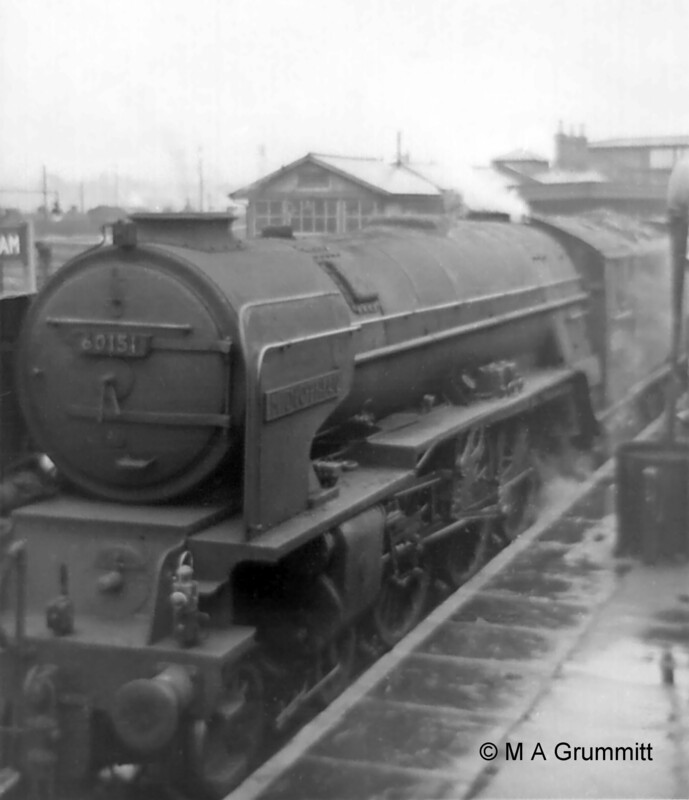 Here is a link to a photograph of one of Grantham's carriage shunt pilot locomotives, taken in 1957. The connections between the western platform line in the left foreground and the carriage sidings were worked by the Yard Box. Shunter Gilbert Needham is walking beside the coaches. o the Up and Down Goods line (not signalled by the Yard Box), on which the train is standing. The locomotive is brand new Type 2 diesel electric No. D6122 on a trial run from Doncaster to Grantham. 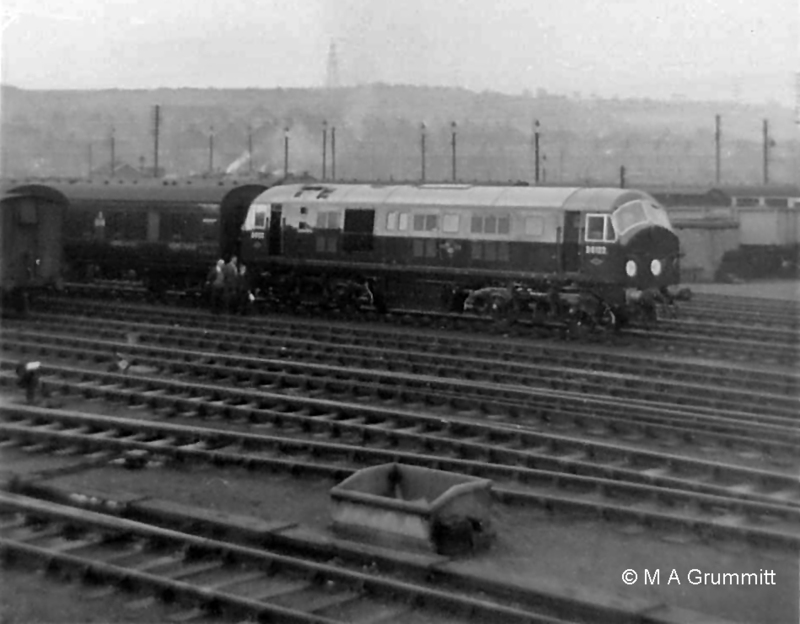 Mick Gummitt tells us "It had just run round its train of empty stock ready to go back to Doncaster - hence all the attention by the inspectors." These locomotives didn't normally operate in the Grantham area. D6122 went into service at Ipswich in the second half of 1959, soon after this trial trip. They were not the most reliable machines. All 38 initially sent south (to Hornsey, Stratford and Ipswich) returned during 1960 to Scotland, where they had been built, to see out their relatively short service lives. 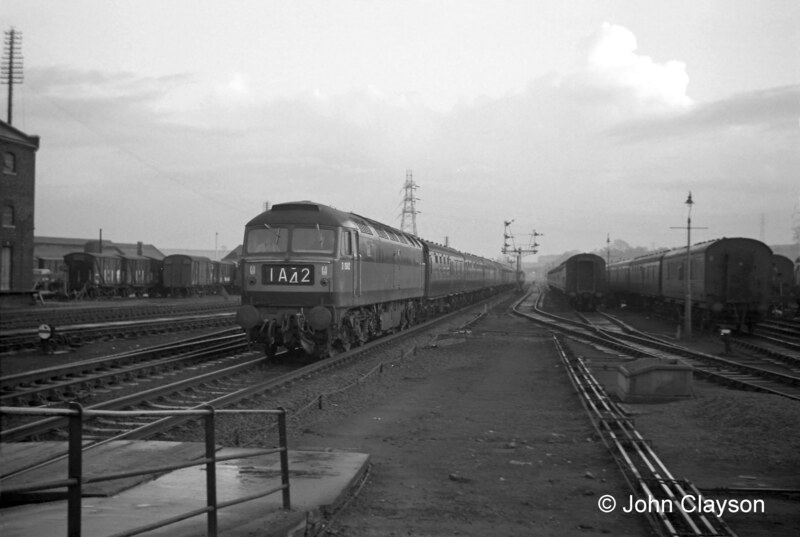 Here is a link to a photograph of the Western platform taken on 17th May 1962. On the right is the platform starting signal. Below it on the same post is a disc signal which the Yard Box signalman has pulled 'off' for a shunting move, either to allow the locomotive to detach and run round the coaches for the return trip, or to draw forward with the coaches into the carriage sidings to clear the platform for the next arrival. There is a view of the front of this signal in the photograph below. This is a view of the south end of the Western platfrom in early summer 1971 (before 27th June, when the Yard Box closed). The signal on the Western platform controls access to the south, either along the Down Slow line towards the South Box (the upper arm) or into No.1 Carriage Siding (the disc signal). In the distance to its left is the signal controlling the Down Slow line as it approaches the Western platform from the south. In the far distance, just to the right of the disc, is Grantham South box. The carriage sidings are virtually unoccupied. Class 47 No.1577 has charge of an ironstone train on the Up and Down Goods line.